RETROactive has been publishing for almost three years now. We will continue to be your source for news and information about Alberta’s historic places. At the same time, we’re going to start bringing you articles providing insight into other aspects of Alberta Culture’s work to understand, protect and conserve historic resources. This post is the first showcasing the work of Alberta’s Archaeological Survey. By the time Europeans and their guns arrived, 250 years ago, in the place that would become Alberta, the area had already witnessed 10,000 years of big game hunting. Alberta’s prehistoric hunters killed mammoth, an extinct horse, an over-sized species of extinct bison, and even camels that roamed the plains millennia ago (Figure 1). Analyses of stone tools have revealed traces of mammoth and horse blood on spear tips in northeast Alberta and southwest of Lethbridge, respectively. Other evidence of prehistoric big game hunting includes human-made cut marks on animal bones found with stone tools. 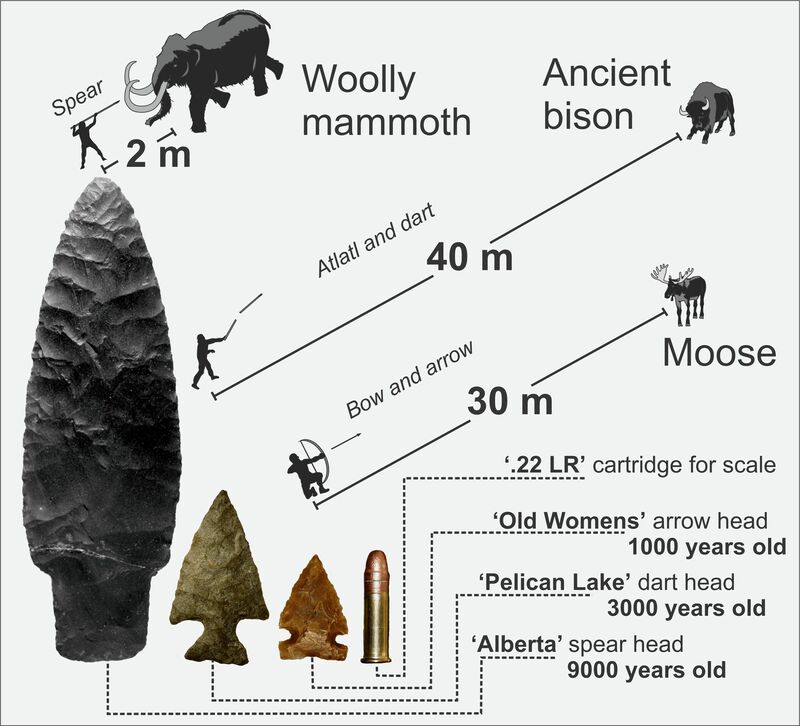 Figure 1: A selection of wildlife that greeted Alberta’s hunters 10,000 years ago. At eight tons and over three meters tall, the woolly mammoth towered over human hunters. So how did people with thrusting spears bag this massive grazer without being gored? Most likely with ingenuity and teamwork. Mammoths, as well as horses and large bison are herd animals that were probably corralled into situations that gave people the upper hand like bogs, canyons, and cliffs where lumbering prey would get trapped or stuck in the mud. In addition to the dangers of hunting big animals, people also had to contend with big predators like the now-extinct American lion, which has been found in Calgary and Edmonton. It was taller than a polar bear (but much faster) and likely kept people on fearful watch. By 8,000 years ago, Alberta hunters acquired a new weapon that put some distance between themselves and future food: the atlatl (spear thrower) and dart (a short spear). The atlatl enabled people to throw weapons with much greater force (Figure 2). Figure 2: Hunting technologies in Alberta. 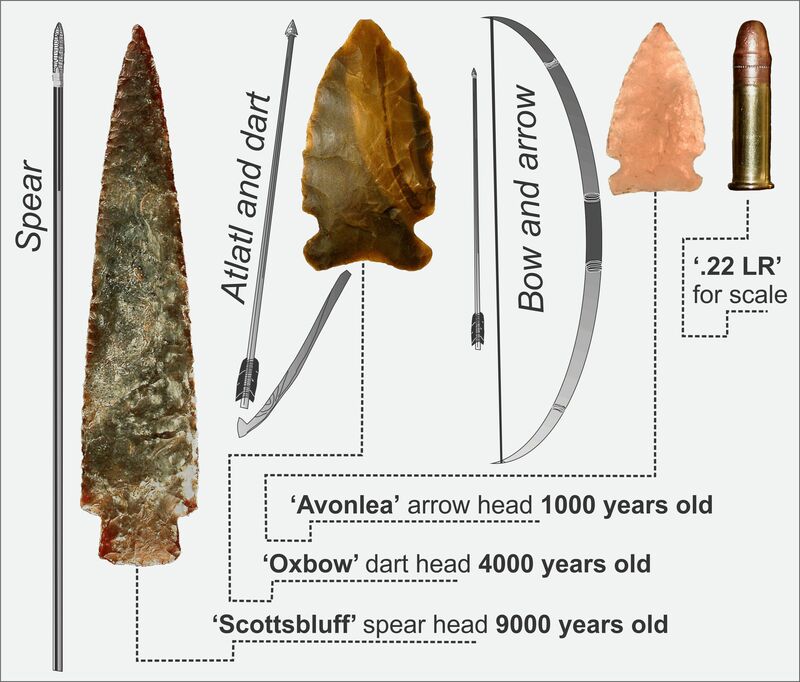 Around 2,500 years ago, stone tips on ancient weapons become much smaller which indicates the arrival of bow and arrow technology. The bow and arrow was effective at about 30 m away (Figure 3) so why adopt a new hunting system that required people to get closer to big game than the older atlatl? Figure 3: Hunting ranges of Alberta’s ancient weapon systems. Imagine wearing a blind-fold on an autumn day and listening to the difference between a stationary archer and a javelin thrower lunging across the dry leaf litter. The bow and arrow was quieter because it required much less movement and it was also more accurate. 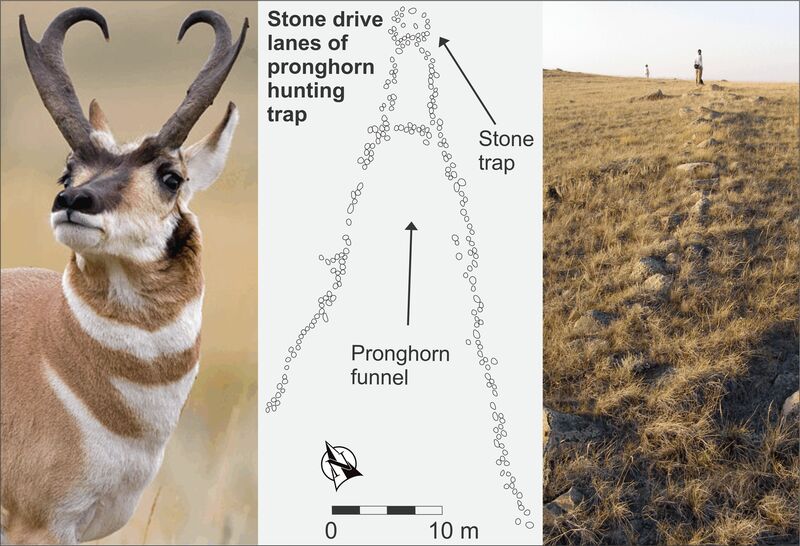 Figure 4: Ancient pronghorn hunting trap. The map is of stone drive lanes in Southeast Alberta and the photograph at right is of archaeologists mapping a pronghorn drive lane north of the Red Deer River. Head-Smashed-In Buffalo Jump near Fort Macleod is a world famous example that was used for over 5,000 years. Small piles of stone were built in converging lines creating drive lanes that extended several kilometres. These piles stabilized branches and leather strips that waved in the wind and frightened bison, which were funnelled down the drive lanes and over steep cliffs. Up to 200 animals could be killed in one day. Buffalo jumps are one of the largest prehistoric meat-capturing events on the planet and it happened thousands of times over thousands of years on the rolling prairies of Alberta. Moose, elk, deer, and caribou were snared, stalked in deep snow, and speared from boats while swimming. In the winter, beaver and bears were speared in dens and lodges. Alberta’s early hunters called game with birchbark horns, rubbed scapulas on trees to imitate antler raking, dressed in coyote skins to more easily approach bison, and regularly burned small areas to stimulate plant growth that attracted big game. Archaeology tells a story of thousands of years of successful big game hunting strategies. While archaeologists have learned a great deal about ancient hunting, much remains to be discovered. Alberta Culture’s Archaeological Survey maintains records of new archaeological discoveries across the province to enable their protection. If you come across an arrow head or other stone tools, please take a few photographs or jot down some notes to share with us so we can continue to learn about the province’s rich hunting history. You can contact the Archaeological Survey at 780-431-2300. Written by: Todd Kristensen, Northern Archaeologist & Darryl Bereziuk, Director, Archaeological Survey. My name is Rebecca Goodenough and it is a real pleasure to introduce myself as the newest member of the Historic Places Stewardship team. I have read the bios of Historic Places staff on RETROactive with much interest over the past few years, wondering if (sigh) I might ever have such an amazing job. So it is with much excitement and a lot of humility that I introduce myself as the new Municipal Heritage Services Officer. I look forward to meeting a many of you over the coming months. Unlike many of my colleagues, I came to the field of heritage conservation more recently and the majority of my education and work experience has been within the world of land use planning. I have worked in both the private and public sectors in British Columbia and Alberta. Most recently, I worked for Strathcona County as a Planner. My interest in heritage grew from personal curiosity. I read books and took every opportunity to attend a course, lecture, meeting or conference related to heritage. The more I learned, the more I became a believer that heritage conservation is a means to achieving a great many of the long-term goals that planners and other community builders try to achieve through their day-to-day work: sustainable development, building a sense of place, quality in design, local economic development. All of these goals and more I believe are achievable through building a culture of respect for our past. While with Strathcona County, I was fortunate to have had the opportunity to complete a Professional Specialization Certificate in Heritage Conservation Planning through the University of Victoria. This program provided me with a strong foundation in the principles and practices of the field. I also helped to establish Strathcona County’s heritage program, which included participation with the Municipal Heritage Partnership Program. I hold degrees in Political Science from the University of Alberta and in Northern and Rural Community Planning from the University of Northern B.C. In my spare time, I enjoy participating in a few activities (at a very pedestrian level) including running, cross-country skiing and playing the piano. And, of course, I am still reading and attending those courses, lectures, meetings and conferences because there is always so much to learn! I hope to bring my experience working with a range of communities and my understanding of municipal processes to my work with the Municipal Heritage Partnership Program and Alberta Main Street programs. More importantly, I look forward to meeting all you advocates for local heritage out there and hearing about the significant places in your communities. 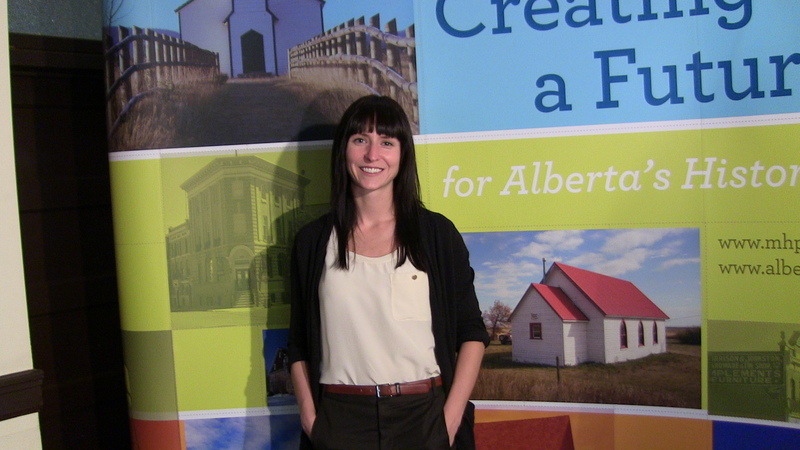 Lacombe wins the Great Places in Canada competition! Lacombe’s Historic Main Street named Best Street in Canada. The City of Lacombe’s historic main street was just named Best Street by the Great Places in Canada competition. The Great Places in Canada competition is sponsored by the Canadian Institute of Planners, annually. 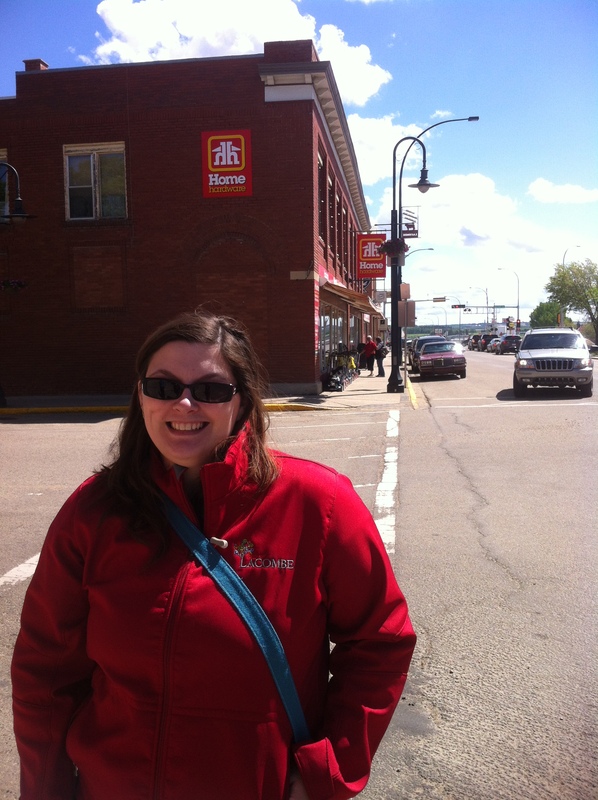 Lacombe’s Historic Main Street was shortlisted in the Best Street category by popular vote. It was then selected as the winner by a panel of experts from the Canadian Institute of Planners. We’re thrilled that one of Alberta’s historic main streets has received national recognition. You may recognise Lacombe’s main street—50th Avenue in Lacombe is one of Alberta’s iconic streetscapes. Most buildings in downtown Lacombe were constructed in the decade before the First World War. A building bylaw, aimed at limiting the destruction that a fire could bring, required that anything built in the downtown be constructed of brick. Many of the Edwardian-styled commercial buildings—such as the Flat Iron Building—are Alberta icons. 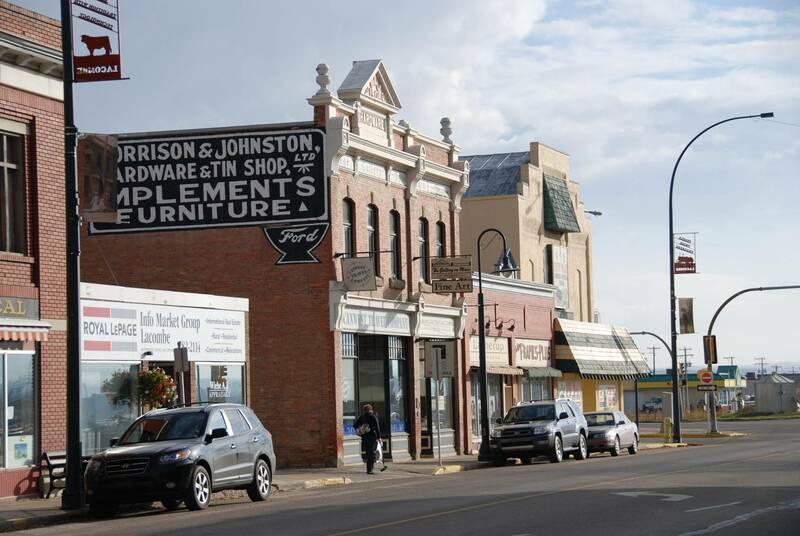 Several of the buildings, such as the Flat Iron Building, the M & J Hardware Building and the Campbell Block are Provincial Historic Resources. These landmarks would most likely have been lost if not for the foresight and dedication of Lacombe’s citizens. The owners of these gems took a great deal of pride undertaking the conservation work often needed. Lacombe’s forward-looking business community was an early participant in the Main Street Program (from 1987 to 1993). The rehabilitation work undertaken during this time is an important reason why so many of these buildings remain standing. The city has since developed policies to ensure that conservation of its historic commercial district is an important part of its’ development process. The city recently completed both a Downtown Area Redevelopment and Urban Design Plan—which features detailed plans for maintaining the streetscape. The city also recently adopted a Heritage Management Plan (with the help of the Municipal Heritage Partnership Program) ensuring that locally significant historic places are inventoried and can be designated as Municipal Historic Resources. What is really fitting about this award is how it recognises the community’s involvement in these special places. 50th Avenue is not a museum piece, but a destination people go to meet friends, shop and celebrate. This is a lively area with many restaurants and businesses. The Lacombe and District Historical Society operate a museum on the main floor of the Flat Iron Building. Social service agencies and the provincial government have offices on the street or nearby. Popular annual events—the Light Up the Night Festival, the Lacombe Culture and Harvest Festival, and Lacombe days, among others—draw large crowds downtown annually. Recent development has reinforced 50th avenue’s central place in this community. Lest We Forget Park, where the annual Remembrance Day ceremony is held, is just at the end of the commercial area. The Lacombe Memorial Centre, a (relatively) new development, contains the public library, meeting rooms and a hall, reinforce 50th avenue’s centre place in Lacombe’s daily life. Jennifer Kircher, Lacombe’s Planner, told me about how important individual community members were in winning this award. “The Community got really excited about it”, she said. During the voting period people she hadn’t yet met came up to Jennifer to tell her they voted. I’m sure this is just the beginning of our work with Lacombe. The re-launch of the Alberta Main Street Program brings a great opportunity to again work with Lacombe on conserving one of Alberta’s pre-eminent main streets.